Update - August 28, 2013 - Engineers at NASA's Langley Research Center in Hampton, Va., dropped an old Marine CH-46E helicopter fuselage filled with 15 dummy occupants from a height of about 30 feet Wednesday to test improved seats and seatbelts and gather data on the odds of surviving a helicopter crash. They used cables to hoist the helicopter fuselage with its mock passengers into the air and swing it to the ground, much like a pendulum. It was traveling at 30 mph when pyrotechnic devices separated the cables and let the fuselage hit the soil at Langley's Landing and Impact Research Facility. "We designed this test to simulate a severe but survivable crash under both civilian and military requirements," said NASA lead test engineer Martin Annett. 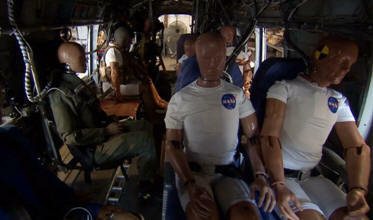 "It was amazingly complicated with all the dummies, cameras, instrumentation and the collaborators, but it went well." The test was a collaboration between NASA, the U.S. Navy, U.S. Army and Federal Aviation Administration. The fuselage hit hard. Thirteen instrumented crash-test dummies and two un-instrumented manikins had a rough ride, as did some of the 40 cameras mounted inside and outside the fuselage. Preliminary observations indicate good data collection, which will take months to analyze. Researchers used the cameras as well as onboard computers, which data from 350 instrumentation points, to record every move of the 10,300-pound aircraft and its contents. 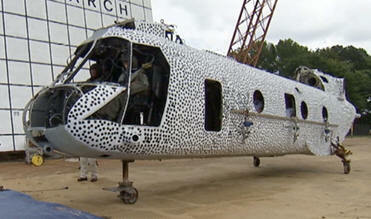 The helicopter's unusual black-and-white-speckled paint job a photographic technique called full field photogrammetry also aided in the data collection effort. "High speed cameras filming at 500 images per second tracked each black dot, so after everything is over, we can plot exactly how the fuselage reacted structurally throughout the test," said NASA test engineer Justin Littell. This was the first of two planned tests using Navy-provided CH-46E Sea Knight fuselages. A similar helicopter equipped with additional technology, including high-performance, lightweight composite airframe retrofits, will be used in a crash test next summer. Both are part of the Rotary Wing Project in NASA's Aeronautics Research Mission Directorate. NASA will use the results of both tests in efforts to improve rotorcraft performance and efficiency. Researchers also want to increase industry knowledge and create more complete computer models that can be used to design better and safer helicopters. The ultimate goal of NASA's rotary wing research is to help make helicopters and other vertical take-off and landing vehicles more serviceable able to carry more passengers and cargo quicker, quieter, safer and greener, and lead to more extensive use in the airspace system. August 21, 2013 - NASA researchers will drop a 45-foot-long helicopter fuselage from a height of about 30 feet to test improved seat belts and seats and advance experimental techniques and crashworthiness data. The crash is scheduled for 1 p.m. EDT Wednesday, Aug. 28, at NASA's Langley Research Center in Hampton, Va. NASA is collaborating with the U.S. Navy, U.S. Army and Federal Aviation Administration on the Transport Rotorcraft Airframe Crash Test Bed full-scale crash tests at Langley's Landing and Impact Research Facility. "We have instrumented a former Marine helicopter airframe with cameras and accelerometers," said lead test engineer Martin Annett. "Almost 40 cameras inside and outside the helicopter will record how 13 crash test dummies react before, during and after impact." During the test, onboard computers will record more than 350 channels of data as the helicopter is swung by cables, like a pendulum, into a bed of soil. Just before impact, pyrotechnic devices release the suspension cables from the helicopter to allow free flight. The helicopter will hit the ground at about 30 mph. The impact condition represents a severe but survivable condition under both civilian and military requirements. For the first time ever in any test, technicians installed a video game motion sensor in the helicopter. "We want to see if it is useful as an additional way to track the movements of the dummies," said test engineer Justin Littell. The outside of the fuselage also is new for this test. Technicians painted one entire side in black polka dots over a white background a photographic technique called full field photogrammetry. Each dot represents a data point. High-speed cameras filming at 500 images per second track each dot, so after over the drop researchers can plot and see exactly how the fuselage buckled, bent, cracked or collapsed under crash loads. Another crash test of a similar helicopter equipped with additional technology, including composite airframe retrofits, is planned for next year. Both tests are part of the Rotary Wing Project in the Fundamental Aeronautics Program of NASA's Aeronautics Research Mission Directorate. The Navy provided the CH-46 Sea Knight helicopter fuselages, seats, crash test dummies and other experiments for the test. The Army contributed a litter experiment with a crash test dummy. The Federal Aviation Administration provided a side-facing specialized crash test dummy and part of the data acquisition system. Cobham Life Support-St. Petersburg, a division of CONAX Florida Corporation, also contributed an active restraint system for the cockpit. NASA will use the results of both tests in efforts to improve rotorcraft performance and efficiency, in part by assessing the reliability of high performance, lightweight composite materials. Researchers also want to increase industry knowledge and create more complete computer models that can be used to design better helicopters. The ultimate goal of NASA rotary wing research is to help make helicopters and other vertical take-off and landing vehicles more serviceable able to carry more passengers and cargo quicker, quieter, safer and greener. Improved designs might allow helicopters to be used more extensively in the airspace system.